Follow NASFAA’s Company Page for updates from NASFAA throughout the year and become a member of NASFAA’s LinkedIn Group to connect with fellow attendees and other NASFAA members; share advice, insights and tips; and ask questions, before and during the conference. Make sure to "like" us at Facebook.com/NASFAA for breaking news and conference updates. If you’re posting pictures from the conference on your own Facebook page, be sure to tag NASFAA in the pictures for the chance to have them appear on NASFAA’s page. 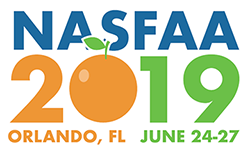 Join in the National Conference Twitter conversation at twitter.com/NASFAA or follow along using #NASFAA2019. Please tweet your conference photos, favorite quotes, and session takeaways using our hashtag.